PREVIOUS:Who Will Be the Next Executive Producer of 60 Minutes? Florence is 35 miles west, southwest of Wilmington N.C., with sustained winds of 75 miles per hour, which is down a bit from earlier this morning. The Weather Channel meteorologist Mike Bettes reporting from an empty parking lot in Myrtle Beach, S.C. just before 1 p.m. ET. He’s having a very tough time staying upright in the 60+ mph winds, and he says that will probably remain the case for the remainder of the day. 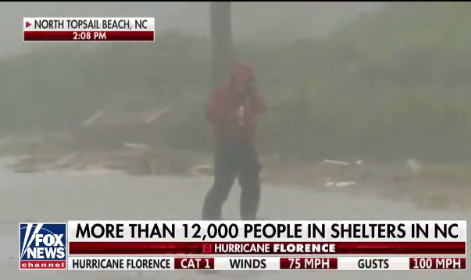 Fox News correspondent Steve Harrigan is braving the elements in North Topsail Beach, N.C. “This is very much a wind event still, and the winds are gusting about as strong as we’ve heard them from the beginning.” Harrigan also told Shep Smith, who is anchoring FNC’s coverage of Florence. Harrigan said that winds are causing structural damage in the area, and “there’s nowhere we can go really…the bridge is closed, and there’s so much debris,” Harrigan continued. FBN correspondent Jeff Flock also had a transformer blow right in front of him while reporting live on Fox News earlier in the day. Ed Lavandera is reporting for CNN from New Bern in the 1 p.m. hour, a small city that has been decimated by wind gusts and flooding. Lavandera was in the middle of telling a story about a family whose home had taken on three feet of water when a transformer exploded right outside the truck. “‘Whoa, that was a transformer exploding right as we were driving past, sorry about that,” he told Don Lemon. “We’re underneath the tarp in the back of a military style high-water vehicle that’s being driven by a retired Marine who’s jumped into action here in New Bern,” reports @edlavaCNN from North Carolina. ABC News will have special coverage of Hurricane Florence beginning Wednesday, September 12. World News Tonight anchor David Muir will anchor the broadcast from North Carolina beginning Wednesday, Sept. 12. 20/20 co-anchor Amy Robach, chief meteorologist Ginger Zee, chief national affairs correspondent Tom Llamas, correspondents Gio Benitez, Steve Osunsami and Victor Oquendo will all report in the field on this storm across the region. Meteorologist Rob Marciano will report from New York. ABC News Live, the network’s 24-hour news channel, will have extensive coverage of Hurricane Florence featuring multiple raw, live feeds of the storm, continuous reports from ABC News’ team of correspondents and meteorologists and live coverage from at least seven ABC affiliates in the affected region. Comprehensive coverage will be available on ABCNews.com, The Roku Channel, the ABC News OTT and mobile apps and ABC News social pages (Facebook, Twitter and Instagram). ABC News’ daily news show “On Location” will feature reports from impacted areas with new episodes posting midday, only on Facebook Watch. CBS News will provide extensive coverage of Hurricane Florence on all broadcasts and platforms with a team of correspondents deployed across several states in the storm’s path. Jeff Glor will lead CBS News’ coverage, anchor the CBS Evening News from the Carolinas beginning Wednesday, Sept. 12, and will anchor on-the-ground coverage all week for CBS This Morning, CBSN and all CBS News platforms. Gayle King, Norah O’Donnell and John Dickerson will anchor coverage on CBS This Morning with a wide-ranging team of journalists reporting in the field. CBS News correspondents David Begnaud, Don Dahler, Adriana Diaz, Kris Van Cleave, DeMarco Morgan, Elaine Quijano and Mark Strassmann will provide continuous coverage from the Carolinas, Virginia and across the Eastern Seaboard for all CBS News broadcasts and platforms. WBBM-TV meteorologist Megan Glaros will track the storm from the field, with WCBS-TV chief weathercaster Lonnie Quinn providing the latest weather updates from the CBS Broadcast Center in New York. CBSN and CBSNews.com will provide the latest updates at www.cbsnews.com/florence. Anthony Mason, Michelle Miller and Dana Jacobson will anchor CBS This Morning: Saturday, and report the latest on Florence with extensive reporting from the correspondents in the field. In addition, CBS Sunday Morning, and CBS Weekend News will provide original reporting on the impact of Hurricane Florence. CNBC also has remote reporting from Kaitlyn McGrath, NBC’s WVIT (Connecticut) meteorologist, as well as continued reporting of the economic/business aspects from various reporters. 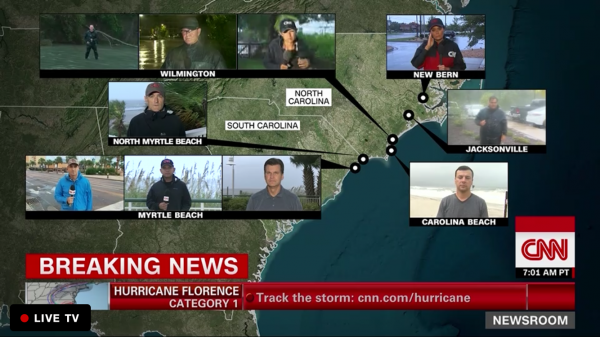 CNN will have anchors and correspondents positioned throughout the region and will provide extensive coverage of Hurricane Florence and its after effects. Fox News will continue to present live breaking news coverage surrounding Hurricane Florence as the Category 4 storm travels towards the U.S. mid-Atlantic coast. America’s Newsroom co-host Bill Hemmer will report live from Wilmington, NC beginning Thursday. FNC correspondents Steve Harrigan, Rick Leventhal, Jonathan Hunt, Griff Jenkins, Jonathan Serrie, Leland Vittert, Lauren Blanchard and Ray Bogan, along with FBN’s Jeff Flock, will be reporting live from various locations in North Carolina throughout the duration of the storm. On Friday, FBN will be live starting at 4 a.m. 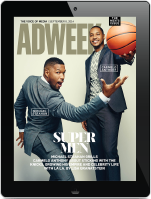 ET, with a special edition of FBN:AM. FBN’s global markets editor Maria Bartiromo will present a special four-hour edition of Mornings with Maria (5 – 9 a.m. ET) to cover the storm’s developments and its economic impact. NBC News, MSNBC, and NBC News digital are deploying full network and digital resources to cover Hurricane Florence as it approaches the Southeast coastal region. Below are coverage plans as of Wednesday afternoon – we will continue to cover the storm around-the-clock. Beginning today, NBC Nightly News anchor Lester Holt anchors from Wrightsville Beach, and news anchor Craig Melvin reports for NBC’s Today and MSNBC from Wilmington, N.C.
Today weather anchor Al Roker will track the storm reporting for Today, NBC Nightly News and MSNBC. Today weather anchor Dylan Dreyer is on the ground in Wrightsville Beach, N.C. reporting on the timing of Hurricane Florence’s impact, what the experience will be like for those who stay through the storm, and the potential damage left in the storm’s wake. On Monday, Dreyer flew above Hurricane Florence with NOAA Hurricane Hunters for a mission to track data on the massive storm. NBC News senior national correspondent and Sunday anchor of NBC Nightly News Kate Snow will contribute from the ground starting Friday. Melvin and Ali Velshi will anchor MSNBC coverage from the ground in Wilmington, N.C. throughout the day. Chris Jansing anchors MSNBC overnight coverage beginning at midnight on Thursday, Sept. 13. Meteorologist Bill Karins reports on the storm’s progression. NBC News’ coverage continues on NBCNews.com/Florence with livestreams of all special coverage and NBC News’ hurricane tracker. Additionally, NBC News digital reporter John Schuppe will be on the ground in North Carolina telling the stories of families riding out the storm and those seeking higher ground. Miguel Almaguer in Wilmington, N.C.
Mariana Atencio in Wrightsville Beach, N.C.
Matt Bradley in Wilmington, N.C.
Joe Fryer in Jacksonville, N.C.
Gabe Gutierrez in Conway, S.C.
Garrett Haake in Virginia Beach, Va.
Tammy Leitner in Conway, S.C.
Cal Perry in Wilmington, N.C.
Kerry Sanders in Carolina Beach, N.C.
Gadi Schwartz in Kill Devil Hills, N.C.
Jose Diaz-Balart will anchor Noticias Telemundo coverage from the Carolinas. In addition to having a satellite truck and portable satellite technology on site, Noticias Telemundo will have three correspondents (Rogelio Mora-Tagle, Javier Vegas and Jorge Miramontes) and its main anchor (José Díaz-Balart) on site. Two correspondents arrived yesterday to Wilmington. NBC’s John Morales will be a special guest of Telemundo’s coverage. Carolina Rosario will be assigned to work for Univision’s weekly newsmagazine Aqui y Ahora this weekend. Al Punto with Jorge Ramos will be done by Univision News Anchor Arantxa Loizaga.